by Koan Jeff "KJ" Baysa M.D. In its own way, tracing the origins of painter Margaret Evangeline’s current works at Elizabeth Moore Fine Art recapitulates the ontogeny of creole New Orleans. Last summer, the artist’s random discovery of an alleged image of Marie du Barry, consort to King Louis XV, led to a fascinating investigation of the tangled and wrought histories of three Maries: Anna Marie Tussaud, Marie Jeanne Becu du Barry, and Marie Laveau. Both Tussaud and du Barry rose from the French lower classes through different paths, and were invited to the royal court. Tussaud survived the Reign of Terror through her utility and service to the sans culottes by receiving the heads of the victims of the guillotine in her apron and casting them in wax to make death masks. Creative license blurs and tangles the histories of Marie du Barry and Marie Laveau, a voodoo priestess and free woman of color in New Orleans who shares her family name of Glapion with Desiree Rogers, the White House social secretary who came under recent criticism after the security breach of a state dinner. In these paintings, the shared voluptuous attributes of du Barry and Laveau, are commingled in a creolization of the former, with the artist experimenting with descriptions of the latter as having “red lips, skin the color of a banana, or bronze, or red gold” resulting in a syncretic identity depicted with a Warholian conceit and palette. The artist remarks that this beauty is eerily and similarly found in present day Rogers. Evangeline effectively deploys the metaphor of stem grafting: placing a scion within a created wound of a rootstock, resulting in hybridity, hardiness, and sturdiness, and in her own words, “the blossoming of a well-tended wound, the essence of creolization.” The opposite and untoward process, dehiscence, the gaping apart of a healing wound, can also be found in the history of the creole. In the signature work of the show, The Psychic Blossoming of a Well-Tended Wound (2010), the painted canvas in oil of a floral motif is apposed with the unique hand colored serigraph on canvas of du Barry, taken through generational degradations of serial recopying, without any intentional matching of sizes or other devices. 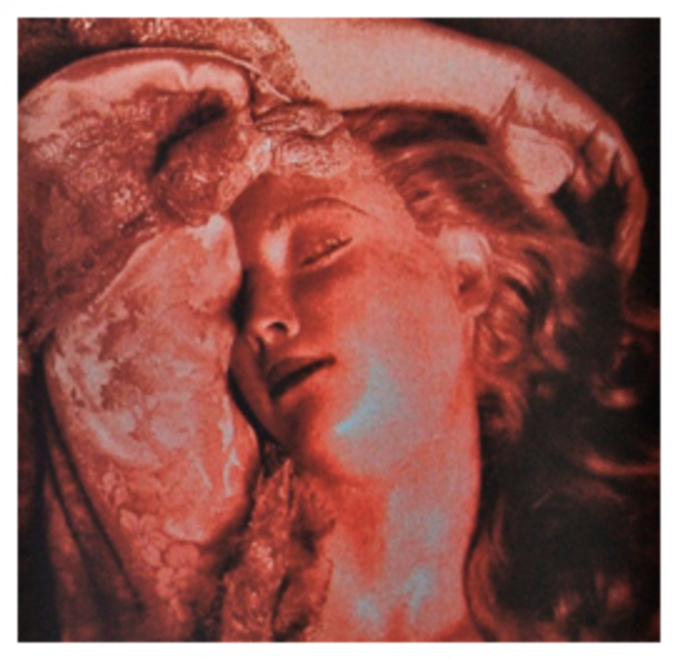 The artist tracks a reincarnation of that image from life to wax to photograph to print to painting in parallel with excerpted histories from du Barry to Laveau (to Rogers). The floral references come from her earlier works with smooth and shiny surfaces, references to water, pierced by shot and creating flower-like blossomings of twisted metal and the transference of this explosive, expanding, spiraling energy into paint. Curiously, these petallated forms can also be read as jewels of knowledge depicted in Buddhist paintings and in its smaller versions with dripping rivulets of paint, invoke the bleeding sacred heart motif seen in Mexican catholicism. The diptych works very well in tale and contrast, attracted like two separately charged plates from different trajectories, but arriving at a brilliant confluence through the creative hand and mind of the artist. Images: The Psychic Blossoming of a Well-Tended Wound (2010) - Detail; The Psychic Blossoming of a Well-Tended Wound (2010), Diptych: (L) Oil on canvas, 72 in x 72 in; (R) Unique serigraph (hand colored) on canvas, 40 in x 30 in. Courtesy Elizabeth Moore Fine Art.